Steve Gee is not a man to shy away from a challenge. Not content with being the boss of QS John Rowan, Steve is standing as Liberal Democrat candidate for his local constituency of Epsom & Ewell. Building is joining him on the campaign trail. The managing director of 100-strong QS John Rowan & Partners has steered the company through two recessions – including a 1990s crash which left the practice with just five staff, who alongside their surveying work had to clean the office toilets because they couldn’t afford extra help. In 2011, after discussions with staff who hail from New Zealand, he offered his practice’s services to help rebuild Christchurch following an earthquake that killed 185 people. At the time, most other construction firms backed away from the troubled £14bn programme amid wrangling over insurance claims and political inertia. Gee’s next test, however, is arguably an even taller order – and certainly comes from a more unexpected quarter. 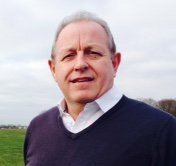 The 54-year-old surveyor, a construction industry lifer, has thrown his hat into the ring as an MP candidate in Epsom & Ewell. Standing as the Liberal Democrat hopeful, he will fight the seat against, among others, justice secretary Chris Grayling – who has a 29% majority. Gee also, somewhat ambitiously, plans to do this around his day job – taking just a relatively short “holiday” of a month in the run-up to the 7 May election itself. For Gee, his campaign, first and foremost, is a chance to draw attention to policies he passionately believes in, on behalf of a party to which he has belonged for the past 15 years. But for others in the industry, his decision to stand presents the chance to see how a man who has spent all his working life in construction copes with the very different world of politics – a world which exerts so much influence over the industry and yet frequently seems incapable of understanding it. It also offers the opportunity to witness first-hand how issues affecting the sector are tackled away from the headlines – in the far more unpredictable world of local hustings, canvassing and sometimes belligerent voters. 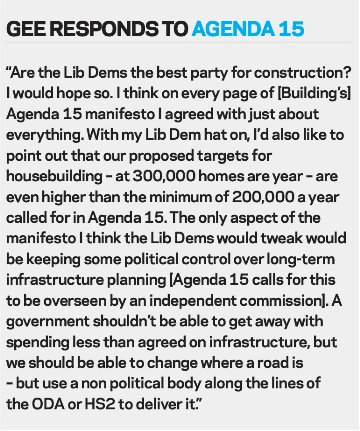 So, for a slightly different perspective on the run-up to the election, Building is joining Gee on his campaign trail, following his progress as he bids to take construction to Westminster – quite literally. In reality, Gee’s candidacy has been driven by a combination of a lifelong interest in politics and a conjunction of circumstances in his local party. He has been a Liberal Democrat member since 2000 and says he is a lifelong Social Democratic Party and Lib Dem voter – apart from in his first election in 1979, when he uncharacteristically voted for Margaret Thatcher (“to my shame”, he winces). He was keen to become actively involved, but chose not to go down the route of council politics – “national politics always interested me more” – and soon after joining the party went through a selection process to be placed on its approved candidate list for parliamentary elections. He stood in 2005 in Wimbledon, in a seat which he thought was below the radar, but was unexpectedly thrust into the spotlight when the Lib Dems – which had previously put up a candidate to oppose the Conservatives but not really fought against Labour in the constituency – decided to contest it on the basis of disagreement with the Iraq war. “Labour pleaded with me not to fight them on it,” he recalls. After this baptism of fire – which ended in a third place finish but an increased share of the vote – Gee chose not to stand in 2010, due to pressures of work. However, he remained an approved candidate and continued to be “heavily involved” with his local party. So this time round, when the Lib Dems needed a candidate in his local constituency, he was the obvious choice. The fact that Epsom & Ewell is also holding local elections in May increased the pressure on the party to find a trusted candidate to battle Grayling despite his large majority, as parliamentary campaigns usually lend credence and resource to the local ones. When Gee and I meet for coffee on what is effectively the first day of his public campaign, he hands me a draft leaflet, hastily pulled together ahead of a hustings he is due to take part in – and which Building will be watching – at Epsom College that evening. It picks out “further income tax cuts for ordinary workers” and “ring-fenced money for schools” as key campaign issues, along with a pledge to increase health spending by £8bn a year. The leaflet also pledges that with Lib Dems in government “action will be taken to cut carbon dioxide emissions,” cheekily drawing a direct comparison with David Cameron’s reported instruction to aides 15 months ago to “cut the green crap” from policies. The issue of sustainability is clearly one campaign area where Gee’s professional knowledge can come into play, and the leaflet also nods to his construction interests by using a picture of two hard-hatted (presumably “ordinary”) workers to illustrate his tax cut pledge. Gee says that his campaign hasn’t directly focused on construction issues in its early days, but “that doesn’t mean it won’t”. He cites the Liberal Democrats’ aim to increase housebuilding as the major area where there is likely to be cross-over with his industry interests, saying that it is his job to explain to people that while the Lib Dems are in favour of “local debate”, these homes are “vital for the economy” and they “have to go somewhere”. This public speaking is put to stern test later, when Gee takes part in his first hustings of the campaign, going head to head with Chris Grayling and the Labour, UKIP and Green candidates in front of an invited audience of sixth formers from six local schools (see below). Finding the time to engage with the more demanding members of the electorate is inevitably going to become more of a pressure for Gee over the coming months. He has taken the decision not to relinquish his professional responsibilities while he carries out his campaign, which he says at the moment is being done in evenings and weekends. He is planning on taking leave for “most” of the four weeks before the election, leaving the day-to-day business in the hands of his deputy, but points out that that’s equivalent to what some would take as holiday. And rather than being in the Bahamas, if he is needed, “I’ll just be down the road in Epsom”. He smiles faintly at this thought. For now though, as Gee heads back to John Rowan’s office to sign off a bid submission, there’s a balancing act to pull off. “I was just thinking I hadn’t prepared enough for the hustings this evening”, he says as he shuffles his papers into his briefcase. “But there’s still a couple of hours. As the night draws in and the five candidates for Epsom & Ewell arrive for the first test of their mettle, it turns out that gaining entry to Epsom College is a challenge that may fell at least one at the first hurdle. The building where the five will be put through their paces by local sixth formers and their guests is a Hogwarts-esque establishment with a baffling number of entrances and car parks. After effectively stalking a small group of students through the darkness, Building is rescued by a friendly religious studies teacher, who explains that the candidates are “enjoying” 15 minutes of drinks with their young questioners, and we are ushered into an imposing lecture hall to await their arrival. The hall is filled with around 200 young people, drawn from local sixth forms, with a few parents and party representatives to boot. At 7.30pm sharp, the candidates march through from the back of the hall to take their seats for the panel debate. Proceedings are got under way by a particularly precocious pupil, who does his best to entertain his peers with some questionable student humour (“This is the Green candidate. So please turn off the lights when you leave”). Questions are to be fielded by a student chair, with an ominously lurid looking timer set to limit the time any one candidate has to respond (according to the religious studies teacher, it looked slightly broken earlier, but she “has faith” it won’t let us down). Once the candidates have been introduced, the questions kick in. The first, over whether the UK needs a longer term policy environment, tees Steve Gee up nicely to talk about his professional experiences, and he makes the point that infrastructure spending “needs cross-party support” and a long-term plan. The Greens’ Susan McGrath points out that climate change is also a prime example of a problem where “a five-year term doesn’t allow us to address issues”. UKIP candidate Robert Leach, meanwhile, takes the opportunity to describe Crossrail as an “excellent project that will be continued under a UKIP government”. Just in case you were wondering. As the questioning progresses, it’s clear that Gee – and indeed the other candidates – have Grayling in their sights. The justice secretary is by a fair measure the most polished of the five, delivering his answers with all the assuredness – and hand gestures – that you would expect from one used to the debating chambers of Westminster. But his rivals for the seat do not miss an opportunity to try to direct the students’ sympathies away from him (“I’d ask Chris Grayling which human rights he wishes to remove from you all”, is Gee’s retort at one point, in reference to the Conservatives’ pledge to allow parliament to veto rulings by the European Court of Human Rights). For Grayling’s part, despite his majority, he says that he “does not believe in safe seats”, and engages willingly in the ensuing hour and a half-long debate – which covers issues from taxation, to the environment, to gay marriage. He also entertainingly interrupts at one point to refute an apparently bizarre accusation from UKIP’s Leach that the UK has been spending money which could be used to address inequality on funding Chinese space programmes (“It’s not even about space – it’s that we don’t actually give money to China”). As the discussion progresses, the audience become increasingly engaged with the candidates, and give the first applause of the night for Labour’s Sheila Carlson’s suggestion that the government’s bedroom tax has fuelled a rise in poverty which has led to food banks being present in Epsom for the first time. As the candidates warm to their topics, the applause becomes more frequent. Gee gets his fair share – notably for his final answer, an emotive discussion of inequality which acknowledges that “parties of all colours” have not done enough to address the problem in the past. Afterwards, despite the odd moment of awkwardness (notably when Grayling says “I’d like to remind Stephen we have been in coalition together for the past several years”), Gee can be pleased with his performance in front of an audience who – even though not all yet of voting age – knew their stuff and, with the confidence and clarity of youth, were not afraid to show it. But the one issue Gee had prepped most for, being sure it would come up – tuition fees – was strangely absent from the debate. It is a disgrace that so many big companies are avoiding paying tax in the countries in which they earn income and this has a real effect in times of austerity on the level of cuts in benefits that the poorest in society have had to bear. It is a great social injustice and something that has to be tackled if we are to create a fairer society. As a party we have just made proposals to raise £8bn of taxes in the next parliament which will include only raising it from the wealthiest in society and from companies that aren’t paying their fair share. So our proposals are fully in line with a principle of eliminating Tax Dodging as we move forward. I was shocked to hear media reports claiming that HSBC helped thousands of wealthy clients avoid tax from countries all over the world and that members of the Tory party seem to think that this isn’t an issue but just what “everyone does”. Since 2010, the Government has closed many of the loopholes exposed in the report and specifically taken action to get back money lost in Swiss bank accounts. HMRC has systematically worked through all the HSBC data that it has received and has brought in more than £135m in tax, interest and penalties from tax evaders who hid assets in Swiss HSBC accounts. But there is still much more to do. That is why I’m pleased that Liberal Democrat Chief Secretary to the Treasury Danny Alexander has made tackling tax avoidance a top priority and has made progress on many of the issues you raise. Since coming into Government in 2010 he has led a crackdown on tax avoidance and evasion that is closing loopholes and making more people pay up. Liberal Democrats in Government have already made over forty changes to the law to close loopholes and make big strategic changes to the way tax is collected to ensure fewer people slip through the net. clamping down on Stamp Duty tax avoidance with a new range of measures. Another big change was to invest almost £1bn in HMRC to tackle tax avoidance, recruiting 2,500 extra members of staff to work on tackling tax avoidance and opening a new Large Business Directorate last year to deal specifically with the tax affairs of the 2,100 largest firms in the UK. Part of their work will be to enforce the new Diverted Profits Tax, which will counter the use of aggressive tax planning methods used by some big firms to divert their profits to areas with very low rates of tax. We hope this tax will yield an extra £1.35bn over the next five years. I am also pleased that we have worked internationally to tackle tax avoidance and that this was one of the main goals of the UK’s presidency of the G8 group of nations. During our presidency, we won G8 agreement on transparency on the real owners of businesses, as well as getting the Organisation for Economic Cooperation and Development (OECD) to develop a country-by-country reporting template for multinationals to report profit and tax information. Over 90 countries are signed up to the new International Comprehensive Report Standards, closing down options for tax cheats, while around £2bn in previously unpaid tax has been brought in from our new agreements with Switzerland and Lichtenstein alone. There is clearly much more to do at home and abroad, but I am proud of the work that Liberal Democrats have done in Government to close loopholes and force tax cheats to pay more of their fair share. Thanks to the steps we have taken, the tax yield for this year will be around £9bn more than when we came into Government in 2010. Going forward, Liberal Democrats are determined not to let up in the fight against tax cheats. If we are in Government again our aim is to make progress on this agenda in every Budget and Autumn Statement of the next Parliament. We will continue to invest in HMRC, as we have done in Government, to enable them to do more to tackle tax evasion and avoidance. We will also introduce a range of other measures, including a General Anti-Avoidance Rule, which goes much further than the current anti-abuse rule. We will seek to extend the requirement for country-by-country reporting from banks and extractive industries to cover all UK listed companies. The majority of these proposals will be introduced through the annual Finance Bill, allowing us to take regular action throughout the Parliament. Labour’s stance on apprenticeships once again prove they cannot be trusted to build a stronger economy. Today (Friday 6 February) they criticised the coalition’s record on creating apprenticeships, even though there are now more apprentices than ever before. In fact there are more than 85 per cent more apprentices in schemes in England than there were under Labour. What’s more is that last March Labour called Intermediate (level 2) Apprenticeships “deadweight” and proposed scrapping the scheme. In government Liberal Democrats have created 2m apprenticeships, enabling young people boost their skills and gain valuable work experience. Jordan is one of the many apprentices to have benefited from the scheme. Liberal Democrats care about giving people alternative routes to skills and education and this means ending the false apartheid between higher education and vocational education. Vince Cable has fought hard to prevent decimating cuts from the further education budget which the Conservatives would have been happy to slash. Only the Liberal Democrats are working towards a stronger economy and a fairer society. The Liberal Democrats have set out their strategy for delivering a balanced budget in the next Parliament. On 5 February Nick Clegg and Danny Alexander outlined the Liberal Democrats’ plans to finish the job of balancing the books by 2017/18, through a mix of tax rises and spending cuts, ensuring that the job is finished fairly. This balanced approach means the Liberal Democrats can protect vital public services like schools and hospitals while also looking after the most vulnerable in our society. The Liberal Democrats will finish the job of balancing the books while protecting vital public services. This will require increasing taxes on the very wealthiest and ensuring big businesses pay their fair share. The plans outlined do not require any increase in the headline rates of taxation, income tax, national insurance, VAT or corporation tax. As well as finishing the job of balancing the books, the Liberal Democrats will continue to protect NHS funding and the international aid budget. The Liberal Democrats will also protect the education spending from cradle to college and will also maintain the triple lock on the State Pension. The Liberal Democrat General Election Cabinet will fight to build the stronger economy and fairer society Britain needs – one with opportunity at its heart, Nick Clegg has said. Nick said the election team would stand up for the liberal values of openness, tolerance and compassion in the face of those who peddle grievance, fear and blame. “This is a Liberal Democrat Cabinet that will fight every day for the stronger economy and fairer society this country needs – where everyone has the opportunity to get on in life. “This talented front bench have shown both inside government and beyond that they stand for a liberal Britain – one of openness, tolerance and compassion. “This is a team that will never pander to the politics of grievance, fear and blame but instead work every day to keep Britain anchored in the centre ground. “In government we’ve proved our commitment to a stronger economy by halving the budget deficit, helping business create 1.8 million jobs and creating two million apprenticeships. “We’ve also shown we care about a fairer society by cutting income tax for the lowest paid, helping struggling school kids and capping the cost of social care. “If in Government after the General Election this team will finish the job and make sure Britain doesn’t lurch to the Right or Left. “We all know Labour are a risk to the economy and the Tories will cut too much, threatening the NHS and sacrificing the least well off. Steve Gee, Liberal Democrat candidate for Epsom and Ewell says “After all the chaos this week in A&E and the worst reported waiting times since targets were set, it’s clear that the NHS needs a boost of funds”. The Liberal Democrats have set out plans to increase NHS funding by at least £8bn per year in real terms by 2020 if the Lib Dems re-enter government after the election in May, trumping the funding promises made by Labour and the Conservatives. The Liberal Democrats are the first party to present a plan to meet the financial needs of the NHS as set out by Simon Stevens, the Chief Executive of NHS England in his Five Year Forward View. Stevens’ report, released in October, outlined an £8bn-a-year funding gap by the end of the next parliament between what the NHS gets and what it needs to deal with increasing demand because of population growth and people living longer. Simon Stevens said the government would face a public backlash if the NHS did not get billions of pounds in extra funding on an annual basis. He hoped for more annual funding than the £2bn injection promised by the chancellor, George Osborne, or the £2.5bn promised by Labour. Baseline into the budget of the NHS, the additional £2bn that Lib Dems secured in the Autumn Statement for 2015/16. In addition we will invest a further £1bn in real terms in 2016/17, as we set out at our Autumn Conference. Once we have finished the job of tackling the deficit in 2017/18, we will increase health spending in line with growth in the economy. scrapping the Conservative shares for rights scheme (saving £100m). As well as increasing NHS funding, the Lib Dems will also commission a non-partisan fundamental review of NHS and social care finances in 2015 before the next spending review, in order to assess the pressures on NHS budgets. The Liberal Democrats are the only party to set out a credible road map for how we will safeguard the NHS over the next parliament. Neither Labour or the Conservatives have a credible response to the funding challenges that the NHS faces. Labour have pledged £2.5bn only to be fully introduced by the third year of the next parliament and have not committed to any additional real term increases beyond that, while the Conservatives have made no specific real terms funding commitments. Only the Liberal Democrats are committed to increasing NHS funding by £8bn in real terms by 2020. The big difference between the Lib Dems compared to Labour and the Conservatives is that we have said that once we have dealt with the structural deficit, in 2017/18 we will link the amount of money going into public services – including the NHS – to the growth of the economy. Opening his first press conference of 2015, Deputy Prime Minister Nick Clegg has branded Conservative plans to tackle the deficit “a con” as he continues to distance the Liberal Democrats from their coalition partners ahead of the general election in May.